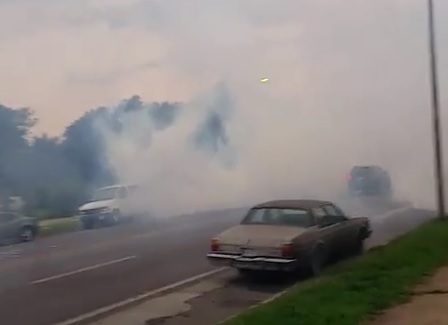 North St. Louis EXPLODES After Police Shooting - Tear Gas, Armored Vehicles - Bottles, Bricks, FIRES, Guns! North St. Louis EXPLODES After Police Shooting – Tear Gas, Armored Vehicles – Bottles, Bricks, FIRES, Guns! Hundreds of protesters and locals took to the street today on Page and Walton where a St. Louis man was shot by St. Louis police officers. Earlier this afternoon protesters hurled water bottles at police. Tonight a line of officers moved in to disperse the protesters. Protesters threw bricks at the police. The police fired tear gas at the protesters. Kenny B. who was reporting at the scene for The Gateway Pundit was one of the two remaining reporters in the area. Local news organizations pulled their reporters a few hours ago. A couple of locals told Kenny and his friend they better get going before sundown so they packed up their bags and left the area. The neighborhood on Page and Walton is not a safe area. Police drew their weapons earlier during a confrontation. More bottles are being thrown. UPDATE: Fires were set in the street tonight on Page and Walton.